The coleslaw can be fully assembled a day in advance and refrigerated, or you can keep the dressing and prepared vegetables separate, then toss everything together before serving. It's not quite as pretty when mixed up ahead of time, but the flavors are more developed. I think it even tastes good (and still looks fine) after sitting for three days in the fridge. The optional fresh basil adds an unexpected taste of summer, and the optional Sriracha sauce (I love that stuff) gives it a nice kick. Try one or both, but keep in mind that the flavor of the basil and the heat from the Sriracha will become stronger if the coleslaw sits overnight. The tangy lemon caper dressing, which is made with mayonnaise and yogurt and lots of Dijon mustard, can be mixed up a day or two in advance; it also makes a great dip. You can use a food processor to chop your cabbage, but I just thinly slice it with a big serrated knife and then roughly chop it. As always, I urge you to seek out local and organic ingredients; they really do make a difference. Hit the farmer's market for homegrown vegetables and this recipe will really shine. You won't believe how much flavor plain old raw cabbage can have. 1. Make the dressing: In a small bowl or large measuring cup, stir together the mayonnaise, yogurt, capers, Dijon mustard, lemon juice, lemon zest, salt, pepper, and Sriracha sauce (if desired). Let the dressing sit while you prepare the vegetables, or refrigerate until ready to use. 2. In a large bowl, combine the green and purple cabbages, carrots, sweet peppers, green onions, and basil (if using) and toss to mix. 3. Pour the dressing over the vegetables and toss to evenly coat. 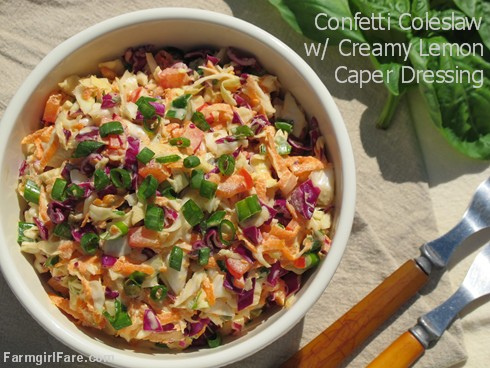 Set the coleslaw aside for at least 15 minutes before serving, or refrigerate, covered, until ready to serve. Adjust seasonings to taste and stir in a squeeze or two of fresh lemon juice just before serving. Garnish with chopped green onions if desired. © FarmgirlFare.com, the seriously slawed foodie farm blog where Farmgirl Susan shares recipes, stories, and photos from her crazy country life on 240 remote Missouri acres. This looks good! I've lost count of how many of your recipes I've kept over the years! I've never been disappointed! 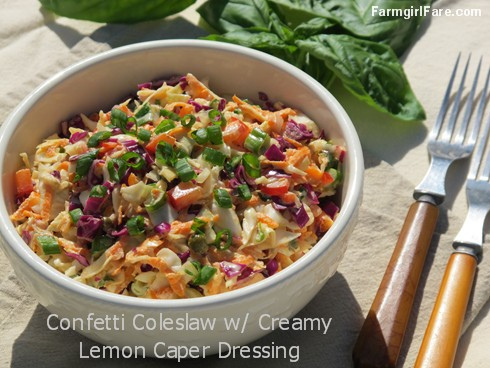 Lemon caper dressing- I am so having this!!! Sounds devine! Oh Susan this is sooooo good! I just wolfed down half of the bowl :) Thanks for a great recipe for the 4th! Yeah, that may have happened to me the first time I made this. ;) So glad you enjoyed the recipe. Thanks for the feedback.! how is this 'light' and/or 'low-fat'? Many traditional coleslaw recipes call for a lot more mayonnaise and/or sour cream. I've seen coleslaw recipes that call for as much as two cups (!) of mayonnaise.